Decision making is a critical function in any enterprise. The decision-making process that is enhanced by analytics can be described as consuming and collecting data, detecting relationships and patterns, applying sophisticated analysis techniques, reporting, and automation of the follow-on action. 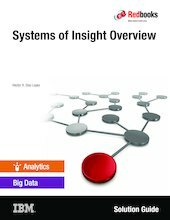 The IT system that supports decision making is composed of the traditional "systems of record", “systems of engagement”, and the “systems of insight”.